Size: 6.32" x 3.1" x 0.80"
Texas Instruments France promoted already in 1988 with the Galaxy 10 a calculator with country specific particularities. Both the TI-40 Collège and TI-40 Collège II continued this approach in 1997 resp. 1999 and supported the "French fractions". Starting in 2005 Texas Instruments put another log on the fire and changed not only the computing algorithm but even keys, notations and menues to French language with the colorful TI-Collège. 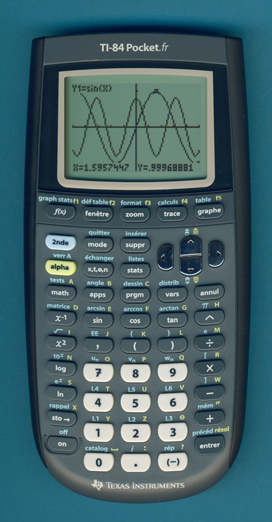 Texas Instruments France introduced in 2006 with the TI-82 Stats.fr the first nationalized graphing calculator. In February 2008 hit the TI-Collège Plus the market and in June 2008 was the TI-83 Plus.fr introduced in the local market. We know the astonishing TI-76.fr since June 2009 and this amazing TI-84 Pocket.fr was introduced two years late in Summer 2011. And what is so amazing with the TI-84 Pocket.fr? Just the size, it packs the specifications of the original TI-84 Plus into a much smaller footprint. Don't miss the similar TI-84 Plus Pocket SE introduced a few month later in Asia. The picture on the right gives an enhanced view of the ASIC that clocks the Z-80 microprocessor with 15 MHz and incorporates the RAM, USB-Port and logic. Please notice the smaller package of the new TI-REF 84PLCR/TA1 ASIC compared with the previous TI-REF 83PLUSB/TA2 or TI-REF 84PLUSB/TA3 found in the TI-84 Plus family manufactured between 2004 and 2007. This TI-84 Pocket.fr manufactured in April 2011 makes use of one AMIC Technology Flash-ROM with 1M Byte capacity. The driver circuit of the LC-Display was traditionally manufactured by Toshiba for Texas Instruments' graphing calculators. This TI-84 Pocket.fr manufactured in 2011 shows with the Novatek NT7564H a one-by-one replacement. It is just a bare chip mounted on a flexible piece of circuit board attached between the display and the main PCB. The TI-84 Pocket.fr is permitted (as of November 2, 2011) for use on SAT, ACT, PSAT and AP exams. © Joerg Woerner, November 2, 2011. No reprints without written permission.